Shown above with standard luminous hands. 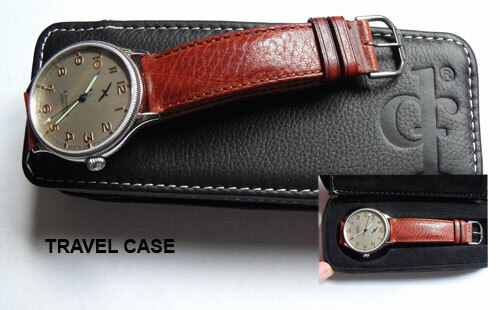 The watch case and dials are identical in both versions, however the case back on the manual wind reduces the watch thickness by 2mm… making it one of the thinnest watches available. A tribute to the famous "Citabria®"
A pre-war Chief of a different color, the "Citabria®" was first introduced by the Aeronca Champion Aircraft Corp. in the mid 1940's. Their famous Aeronca Champ, a plane in which d.freemont took his 1st airplane ride, was the basis for the souped-up and acrobatic air worthy plane known as the "Citabria®." Citabria® spelled backwards is Airbatic. Steve Fossett was flying a Citabria® on the day he went missing. *Note: To the best of our knowledge “Citabria” is a registered trademark of the Bellanca Aircraft Corp.
**Paypal is not a valid payment option for our 60-20-20 plan. You must use a credit card. "My Airbatic arrived today and I couldn't be more thrilled. You called it "a beautiful watch" and it is. Beyond doubt it is. As I found with my Prescott, the photo's just don't do it justice. I could begin with the dial: the subtle color tone and the texturing simply don't show up properly in the photo; or the way the dial seems to shift color from umber to a coppery beige depending on the light. The numbers and indices are gorgeous and beautifully applied. The hands appropriate and easily read. 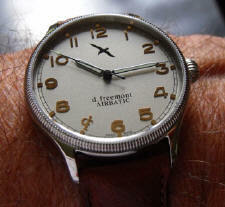 The case is thin enough, even the automatic, to fit neatly under a cuff. The polish is superb. and the machining of the coin edge and onion crown exceeds excellent. The df emblem at the 7 pm position a nice touch that my prescott didn't have. And, on the rotor, the identifying number N 19 much more easily read than the 33 of my Prescott (which I need magnification to see, though that may be my fading eyesight). It is a very very cool thing to know I am unlikely ever to see either watch on any another wrist...and this number is unique to me. The watch is regulated to just over 2 seconds a day. AMAZING...and I thought my Prescott's 5.8 was wonderful. Finally, I think you for the distressed brown band you included. It's perfect. Exactly what I was looking for. 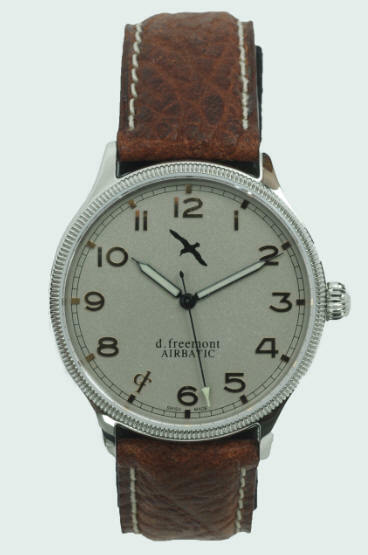 This watch, genuinely, can be worn as a casual sport or dressed up for formal occassions and be at home in either setting. I love it.